Purpose: Ovarian cancer is one of the most common gynecological cancers in women. It is difficult to accurately and objectively diagnose benign and malignant ovarian tumors using ultrasound and other tests. Hence, there is an imperative need to develop a computer-aided diagnostic (CAD) system for ovarian tumor classification in order to reduce patient anxiety and cost of unnecessary biopsies. 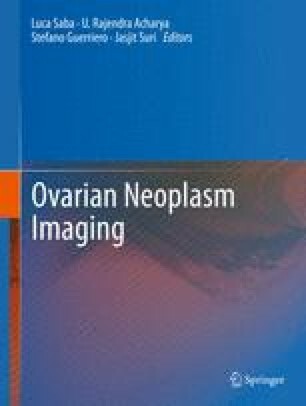 In this paper, we present an automatic CAD system for the detection of benign and malignant ovarian tumors using advanced image processing and data mining techniques. Materials and Methods: In the proposed system, Hu’s invariant moments, Gabor transform parameters, and entropies are first extracted from the acquired ultrasound images. Significant features are then used to train a probabilistic neural network (PNN) classifier for classifying the images into benign and malignant categories. The model parameter (σ) for which the PNN classifier performs the best is identified using genetic algorithm (GA). Results: The proposed system was validated using 1,300 benign and 1,300 malignant images obtained from ten patients with benign and ten with malignant disease, respectively. We used 23 statistically significant (p < 0.0001) features. On evaluating the classifier using tenfold cross-validation technique, we were able to achieve an average classification accuracy of 99.8 %, sensitivity of 99.2 %, and specificity of 99.6 % with the σ of 0.264. Conclusion: The proposed automated system is automated and hence is more objective, can be easily deployed in any computer, fast, accurate, and can act as an adjunct tool in helping the physicians make a confident call on the nature of the ovarian tumor under evaluation. Horner MJ, Ries LAG, Krapcho M, Neyman N, Aminou R, Howlader N, Altekruse SF, Feuer EJ, Huang L, Mariotto A, Miller BA, Lewis DR, Eisner MP, Stinchcomb DG, Edwards BK, editors. SEER cancer statistics review, 1975–2006, National Cancer Institute, Bethesda. SEER Website. seer.cancer.gov/csr/1975_2006. Based on November 2008 SEER data submission. Published 29 May 2009.